Thirsty Pilgrim: Upcoming Beer Events in Belgium Worth Mentioning: Fall 2009 Edition. Upcoming Beer Events in Belgium Worth Mentioning: Fall 2009 Edition. Once upon a time I meant to do this every few months or so. Instead I end up doing it when the sheer weight of festivals on the calendar threatens to crush me if I don't write it all down. Now the burden is yours. 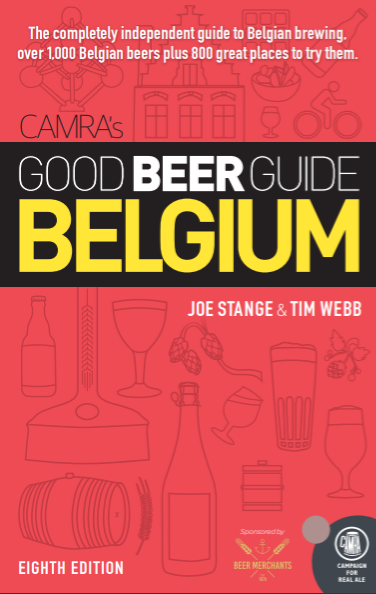 As usual, big thanks to Paul Briggs of the CAMRA Brussels crew for his festival calendar. He assembles a mighty Excel file with great diligence and sends it out via e-mail. If you'd ike to be added to his list, drop me a line to the address mentioned on the left. I'll connect you. Paul's calendar is far more comprehensive than this. I chop off most of the small village fests and open brewing days, keeping only what I think should most interest you. Which is mainly what interests me. Funny how that works. 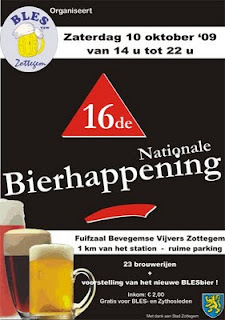 This Saturday, October 10: BLES Bierhappening in Zottegem, East Flanders. There will be 23 breweries, mostly small Flemish ones. If you never have, try that Valeir Extra on draft from Contreras. Runs from 2 to 10 p.m.
October 17-18: Brassigaume in Marbehan is one of the best on the calendar. This festival in the Luxembourg province celebrates small craft breweries, led by locally based Rulles. There will be 19 of them this year, including five from Italy and two from the U.K., but the emphasis is on Wallonian ales. Normally takes place in a tent near the soccer field, about 10 minutes walk from the train station. Just follow the signs. Runs from 2 p.m. to midnight Saturday and 11 a.m. to 8 p.m. Sunday. October 24: Diesters Bierfestival in Diest. Strength in regional breweries but a fairly impressive list otherwise, including a new one from De Ranke called Hop Flower Power. Interesting. Runs from 1 to 11 p.m. in the fest hall at Zoutstraat 11. October 24-25: Karakterbierfestival in Poperinge. A fun party with 18 breweries at the Palace Hotel. Last year a woman in a nun costume sat in my friend's lap. Can't seem to find that photo at the moment. Struise was there last year; not sure about this year. Runs from 2:30 to 11 p.m. both days. November 7: Public Brewing Day at Cantillon, most likely to coincide with a party at the new Moeder Lambic Fontainas. Watch this space for further details. November 7-8: Bierweekend in Hasselt. There are a handful of draft beers but for everything else you're buying the whole bottle. Bring friends with which to share. Wave a sign in the air and waiters come to take your order. Numbers on the wall tell you if your beer of choice is still available. A classy operation all around. Quite a hike from the train station, though. The Cultuurcentrum is at Kunstlaan 5. November 14-15: Brugsbierfestival in Bruges. A whopping 67 breweries are expected this year in the hall at the old belfry tower, right on the Grote Markt. There are two frites stands out front—will someone please remind me which is the good one? I'll be signing books there on Sunday afternoon at the Cogan & Mater table. Stop by to say hello. December 12-13: Kerstbierfestival in Essen. Totally devoted to Christmas and winter beers, this is simply the best event on the Belgian beer calendar. The smart folks stay in Antwerp and split cabs to Essen. I've never been that smart. Someone want to drive me and my wife there? And someone else want to babysit? Also: Watch for a related article in an upcoming issue of DRAFT. Why do you seem to assume she wasn't a real nun?